What can IBM Storage Networking SAN128B-6 do for you? A next-generation high-speed switch, IBM® Storage Networking SAN128B-6 is designed for flexible integration in large-scale storage networks. NVMe-ready SAN128B-6 enables efficient use of today’s flash storage, and provides advanced security, automation and orchestration capabilities that can simplify operations—from instantiating virtual machines and workload balancing to monitoring traffic. SAN128B-6 offers an expandable set of available b-type Gen 6 Fibre Channel ports for extreme scalability and advanced control features to simplify management. 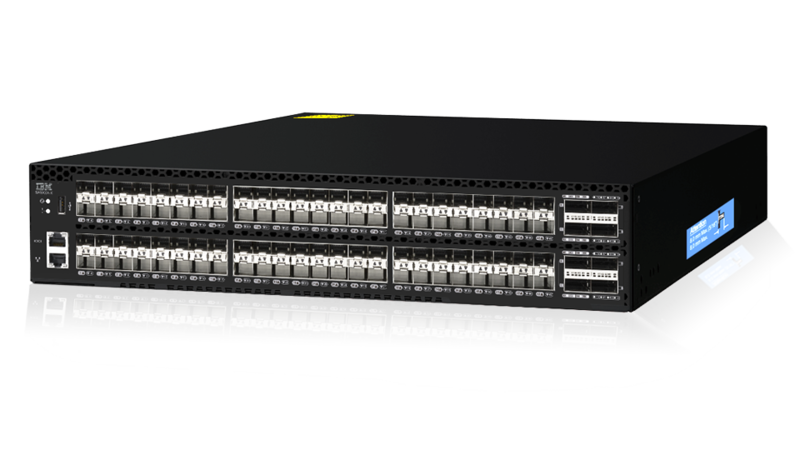 Adapt to storage growth and demanding workloads with a high-density, 128-port 32 Gbps b-type Gen 6 Fibre Channel switch. Optimize performance and enhance reliability with advanced monitoring for NVM Express (NVMe). Integrate NVMe-ready solutions without a rip-and-replace. Simplify end-to-end management of large-scale environments and accelerate operations by automating repetitive tasks. Provide proactive, real-time monitoring and alerting of storage input/output (I/O) health and performance with integrated network sensors. Enable virtual machine (VM) visibility in a storage fabric to monitor and optimize performance and identify anomalies.